1 of 4 Heat oven to 375 degrees. Coat one 4-quart or two 2-quart baking dishes with nonstick cooking spray. If using 1 dish, spread 1/3 cup of the enchilada sauce in bottom. 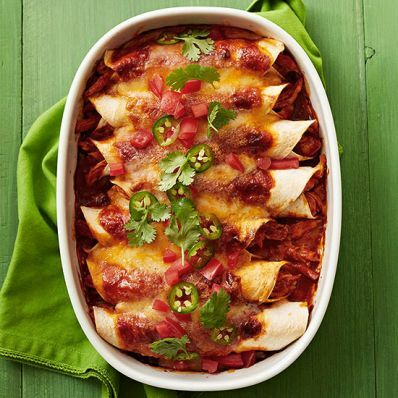 If using 2 dishes, spread 3 tbsp of the enchilada sauce in bottom of each dish. 2 of 4 In a bowl, combine chicken, 1 cup of the shredded cheese and 3/4 cup of the enchilada sauce. 3 of 4 Spread 2 tsp Neufchatel on a tortilla. Spoon 2 to 3 tbsp chicken mixture in a strip in center of tortilla. Roll up tightly to enclose filling; transfer to prepared dish(es). Repeat with remaining tortillas, cream cheese and chicken mixture to yield 16 enchiladas.